Discover a culinary match made in heaven at The Ninth Gate! 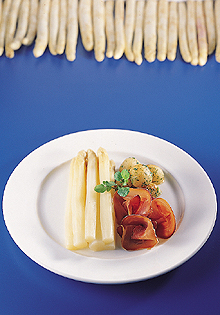 Discover the delights of renowned Black Angus Beef accompanied by fresh white asparagus, one of the world's most tastiest and nutritious vegetables. Enjoy a fantastic lunch or dinner set menu filled with a variety of mouthwatering cuisines. For lunch, savor our Fresh White Asparagus Cream Soup, and Australian Charcoal Grilled "Black Angus" Beef Sirloin in Green Peppercorn Sauce with Potato Cake and Buttered White Asparagus. Or indulge in a leisurely dinner, featuring Goose Liver Terrine with Home Smoked Salmon and White Asparagus in Vinaigrette, Seared Sea Bass Fillet and Lobster Tempura with White Asparagus in Caviar Sauce, and much more. Relish each tender bite of our succulent steak, cooked to absolute perfection, and tender white asparagus bursting with sweet flavors. For one month only, The Ninth Gate invites you to experience our sensational gourmet cuisines.